Ok, so I’ve done some, probably all of those things during my career, often at the same time. Apart from hiding from my boss, although that’s mainly because I’ve had bosses who gave the impression that they were doing their level best to hide from me. However, despite my form, I would not describe myself as a skiver as such. Nevertheless, I’m fairly sure that sitting at home watching telly while getting paid for being at work would fall within most people’s definition of skiving. And within practically everyone’s definition of “a good way to lose your job”. However, this is exactly what I did yesterday, and unbelievably it was completely legit. The mayor had decided that because of the bad weather the schools and university should stay closed for the day. Although the rest of Italy has been battered by flooding and tornados, and despite the ominous forecasts, all we’ve actually had here so far is a bit of a rainstorm last night. But who am I to argue with the mayor if he wants to give me a day off work? And as I looked out of the window at what even someone with the joie di vivre of Schopenhauer would be hard pushed to describe as anything worse than “a bit grey”, I wondered how we would get on in England with a similar policy. Nobody would go to school between November and March, for starters. Combine all the ingredients except the mozzarella, basil, artichokes and parmesan (if using) and spread on the sliced side of the bread. This is probably the right time to tell you that the result will be soft in the middle, like a deep pan pizza. 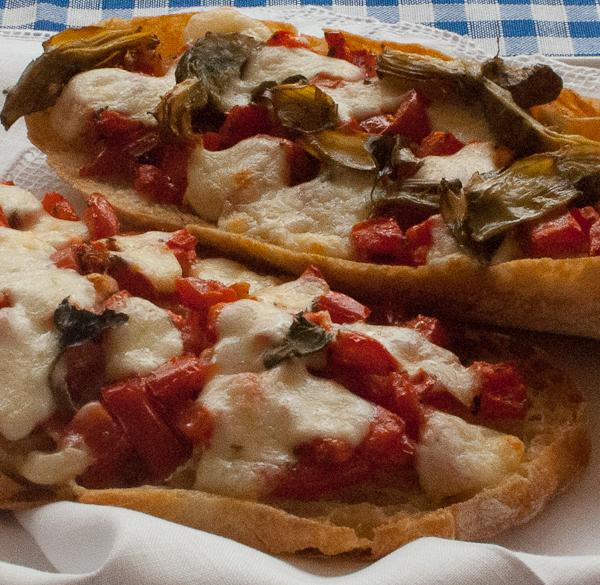 So if you prefer a crispier version, toast the split flatbreads before topping and remove the seeds from the tomatoes. Top with the diced mozzarella and basil (plus any optional artichokes and parmesan), drizzle over some more olive oil, place the flatbreads on a baking sheet, and grill under a hot grill until the mozzarella is bubbling and starting to turn golden (5-10 minutes). This entry was posted in Bread and pizza, Cheese, snacks and tagged mozzarella, pizza, snacks by hungryenglishman. Bookmark the permalink. I wonder why we should remove the tomato seeds; are they to be blamed when what we cook is soaked in water? I usually just leave the mozzarella outside the fridge for one hour or so to dry it out. Not so much the seeds themselves as the heart of the tomato, where most of the juice is. 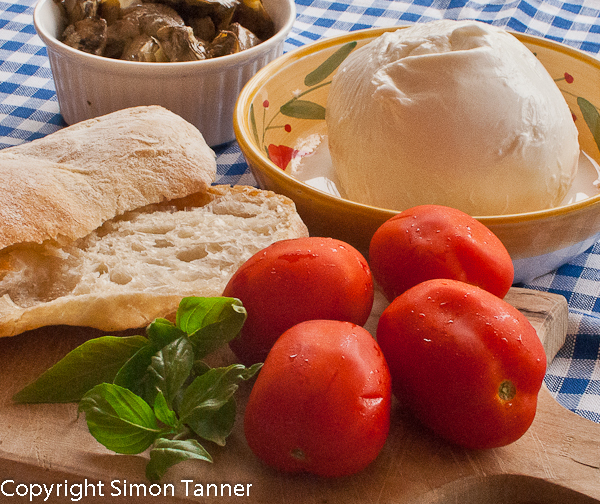 Yes, the mozzarella makes a difference too – the better it is, the softer and milkier it will be. A real classic! The artichokes a great touch!